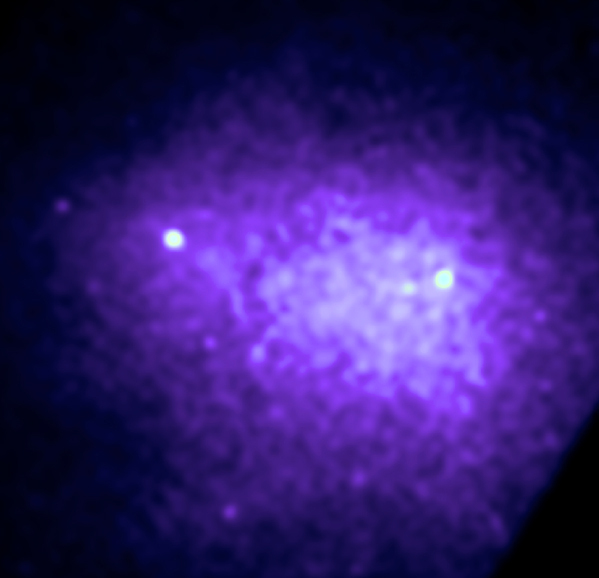 This Chandra image shows the central region - about 1.5 million light years across - of the Coma Cluster. The cluster contains thousands of galaxies enveloped by a vast 100 million-degree Celsius gas cloud. Of particular interest are the concentrations of cooler (10 to 20 million-degrees) gas around the large galaxies NGC 4889 (left) and NGC 4874 (right). These clumps of gas, which are 10,000 light years in diameter, are thought to be produced by matter ejected from stars in the galaxies over a period of about a billion years. 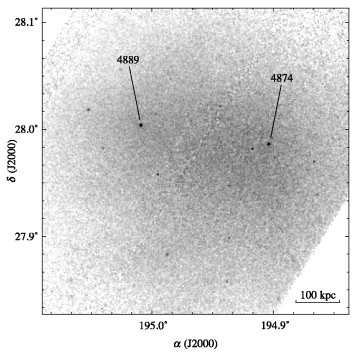 As discussed by Alexey Vikhlinin and his colleagues at the Harvard-Smithsonian Center for Astrophysics in Cambridge, Massachusetts, in the 2001 July 10 issue of The Astrophysical Journal, the observation of relatively cool gas clouds in two large galaxies indicates that they are unlikely to be short-lived features. The scientists suggest that the clouds exist in a delicate balance in which the energy lost by X-radiation is precisely balanced by energy gained by heat conduction from the hot gas of the cluster. Because of the large difference in temperature between the hot gas and the cool clouds - like a snowball in a blast furnace - this balance would require that the heat flow from the hot gas be greatly reduced, perhaps by the magnetic fields in the galaxies that separate the hot and cold components. Scale Image is 16.5 arcmin on a side. Coordinates (J2000) RA 12h 59m 48s | Dec +27° 58' 00.00"